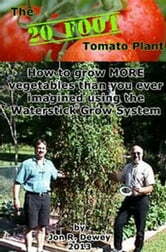 In my first book ( The 20 FOOT Tomato Plant ), I teach you how to grow an amazing amount of food in very small spaces, using LESS water, LESS chemicals, and NO toxic pesticides. I was raised on a small farm, and I’ve been gardening and inventing new ways to grow MORE food in SMALLER spaces almost my entire life. I wrote the book so it was very easy to read, and whether you are a Beginner Gardener or a Master Gardener, you will grow more vegetables than you ever dreamed possible using this system. 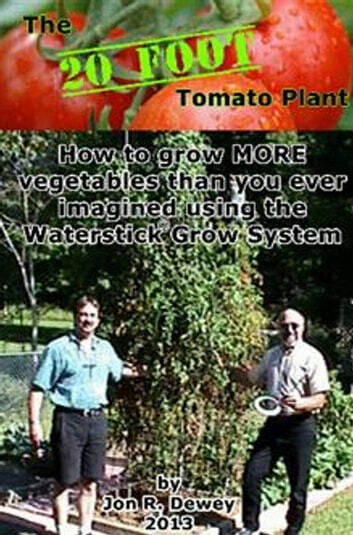 THE WATERSTICK® It allows you to water and fertilize the entire root of your plants at root level. Watering and fertilizing at root level you will use 75% LESS water to grow MORE food. SUPER42VITALIZER® my vitamin based fertilizer. This is a blended fertilizer with a powerful vitamin formula added that makes the plants grow big and strong. BUG JUICE® an Organic Pest Repellent. BUG JUICE® is given to the plants at root level through my WaterStick®. The plants absorb it though the roots, so a wind or rain storm can’t blow or wash it off the plants. BUG JUICE® does not kill bugs, it REPELS bugs using organic ingredients that are perfectly safe for humans. BUG JUICE is also a fantastic organic fertilizer as well. I also give MANY tips to help keep your gardens soil in perfect condition and to make your gardening experience as easy and enjoyable as possible.